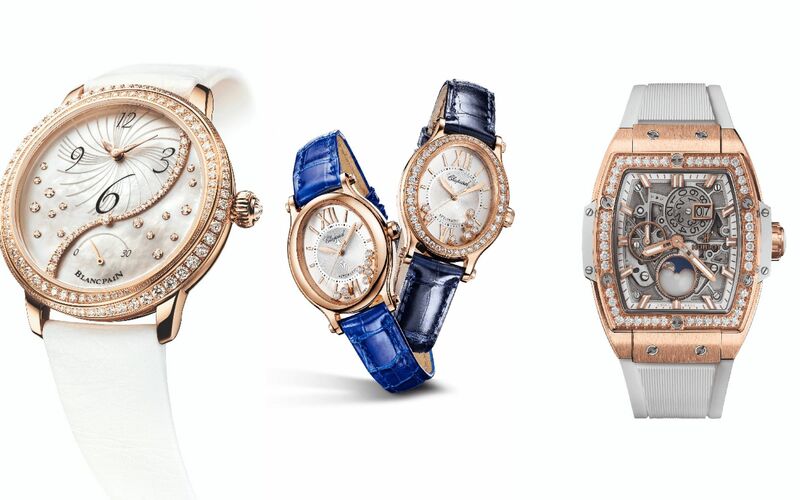 This Mother’s Day, surprise that special woman in your life with a gift of one of these Swiss timepieces where high jewellery meets high watchmaking. She really deserves the best of both worlds. We love how the bezel is composed of interwoven rows of diamonds in different sizes, complete with a diamond-set crown. The mother-of-pearl dial is also tastefully set with diamonds including the wavy divider snaking across the dial separating the off-centre hour-and-minute sub-dial and the retrograde 30-second indicator. The Calibre 2663SR heartbeat boasts exquisite Cotes de Geneve finishing and an oscillating weight shaped like a five-petal flower. Here's our list of favourite timepieces at Baselworld 2018, and it includes a special Blancpain watch. Revealing the automatic BVL 191 skeleton movement in all its glory, the openwork dial eschewed the usual numerals and markers with the letters forming the brand name – an eclectic style that would certainly please the unconventional woman. For a feminine touch, the crown is crafted of cabochon while the hands are coloured in red lacquer. Choice of straps include gem-bright alligator or Serpenti bracelet. This feminine classic is an absolute delight with seven moving diamonds that spin “like étoile dancers performing variations between two sapphire crystals”. To fit the new 30mm oval case shape, the manufacture actually developed a special automatic movement, the 09.01-C with 42 hours of power reserve. Often seen in a rectangular case, Corum's Golden Bridge with the iconic baguette movement is now highlighted in a round 39mm case. Available in pink or white gold, the bezel, dial and horns are fully paved in diamonds for a total of 6.41 carats. The choice of aventurine for the dial brilliantly matches the day/night complication at ‘6’ composed of a disc that makes one complete rotation every 24 hours. The disc is meticulously etched with the sun on one side and the moon on the other; depending on the time of day, they take turns hiding behind the half-circle diamonds. Operating this complication, which is synced to the hours and minutes, is the automatic GP330-00900 with a gold oscillating weight. Framed by a King Gold case set with 48 diamonds, this robust-looking watch features an openwork dial that showcases the automatic HUB1770 movement operating a big date disc (seen between ‘12’ and ‘2’) and the moon-phase at ‘6’. A structured rubber strap in white completes this unusual sporty-feminine offering. Hublot announces rapper Joe Flizzow as Malaysia’s first friend of the brand. Don’t let the demure mother-of-pearl dial with diamond markers and diamond-set bezel fool you. It actually belongs to the Swiss brand’s only family of watches to be entirely certified as a chronometer by Contrôle Officiel Suisse des Chronomètres (COSC). It derives its superpower from the balance spring made from silicon, a resistant and light material immune to changes in temperature, magnetic fields and atmospheric pressure. Playing up the 1960s vibe with turquoise and green malachite, the watches are embellished with diamonds and matched with similarly coloured alligator straps. Do you know the difference between mechanical and quartz movement? The name, which was coined in 2013 with a jade dial, is a little misleading considering the new range of watches features mother-of-pearl dials, but it does continue to pay homage to precious stones, this time highlighting the diamonds. No less than 76 diamonds adorn the bezel while 10 more appear on the wavy, leaf-like motif on the lower left side of the dial. The highly reliable automatic UN-815 with 42 hours of power reserve operate the simple three-hand model.